You should understand that the things that you hope to befall are actually about to occur. When you engage in daydreaming, it is often just an idle wish that you are really not expecting to occur. When you engage in visualization, you actually expect the great things to happen. The positive things that you visualize should be exactly unfolding around you as they would tend to be in the real world. You tend to view things as if they are in fact taking place. Similarly when you imagine the weird things and your mind full of anxiety and fear your imagination will make you feel scared. Your imagination is the engine of your thoughts. It converts your thought power into positive thinking, motivation and shows your desired outcome as a result of imagination and creative visualization. We should learn to envision an ideal reality in the present moment, present our pictures to life as if screening a movie and indulge all our senses. When you are thinking about a problem or situation, imagine that you cannot fail. Think about options you normally wouldn't consider because you think they are risky. 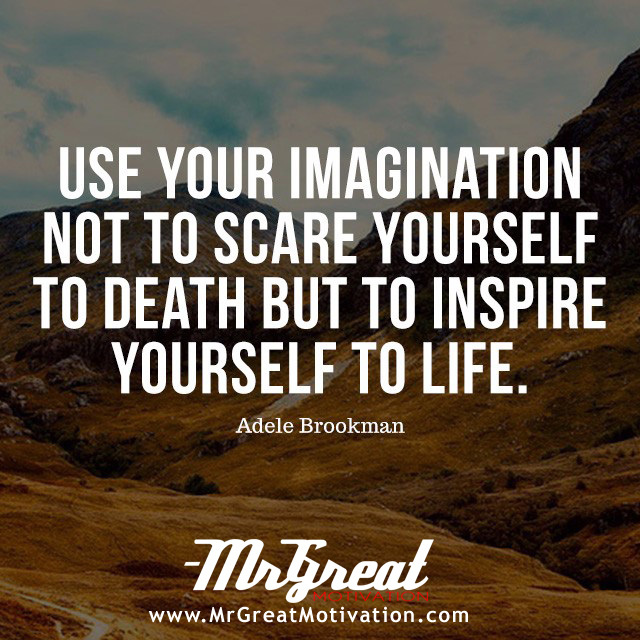 You can use your imagination to encourage you through a number of situations. You can use it to help solve a problem or to help unlock your creativity for new business, new hope to other or new ventures. Rather than just fear of death.